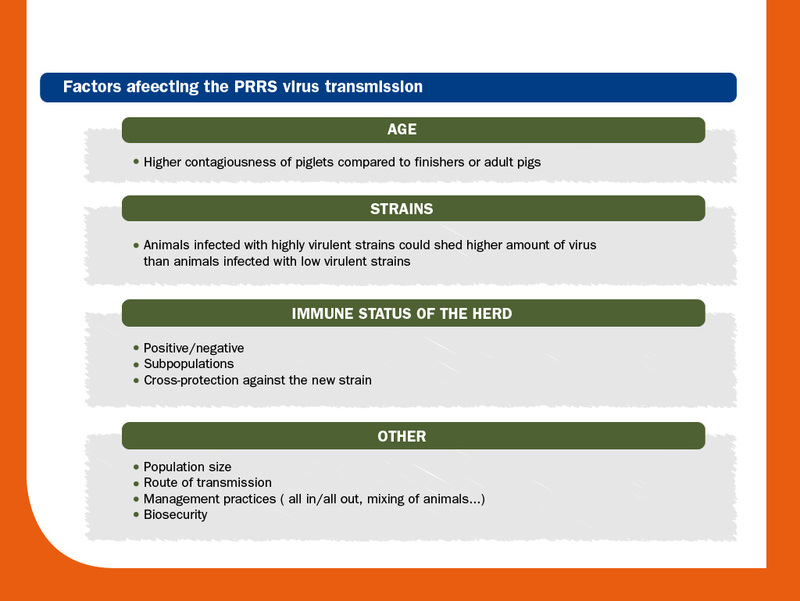 The knowledge of the dynamics of PRRS virus circulation within a herd and the quantification of the virus transmission in a pig population are key points for the development of prevention and control strategies of the infection, as well as for evaluating the impact of such interventions. 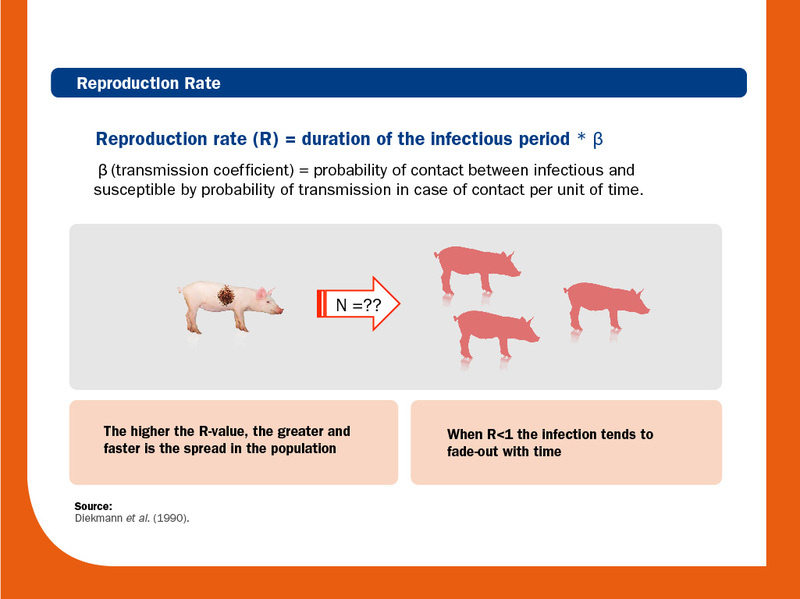 The assessment of the reproduction rate (R) is one of the most common ways to quantify the transmission of a pathogen. R value depends on the infectiousness of the pathogen, on the susceptibility to the infection of the individuals and on the probability of an effective contact. 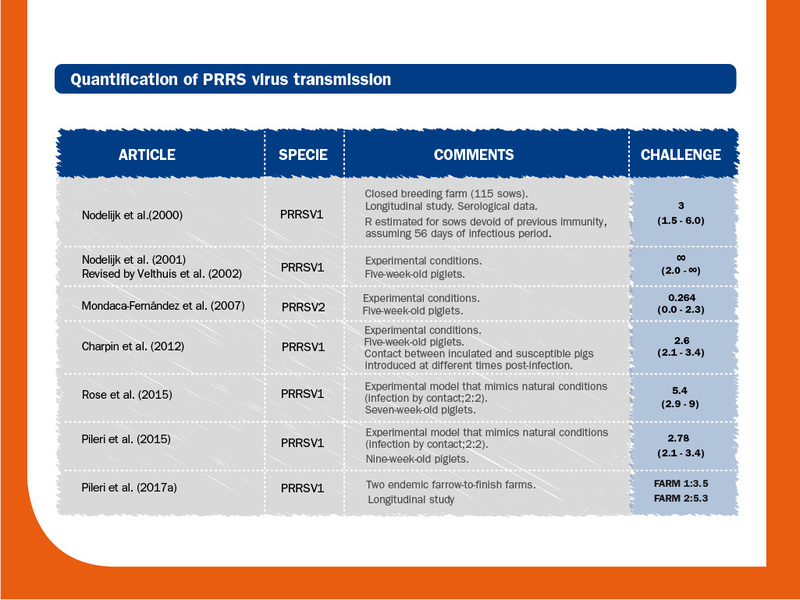 Unfortunately, only few studies have been published regarding the quantification of the PRRS virus transmission, mostly using PRRSV1. According to most of the above mentioned studies, it seems that R ranges from approximately 2 to 7, at least for PRRSV1. These values do not fit the general assumption that the virus spreads very quickly; on the contrary, they are compatible with a relative slow transmission. As a matter of fact, when compared to other swine pathogens, such as Aujeszky disease virus (R=10), Swine influenza virus (R=10) or Classical swine fever virus (R=15) it can be concluded that R for PRRS virus is low and therefore, that it is not as easily transmitted as the mentioned viruses. 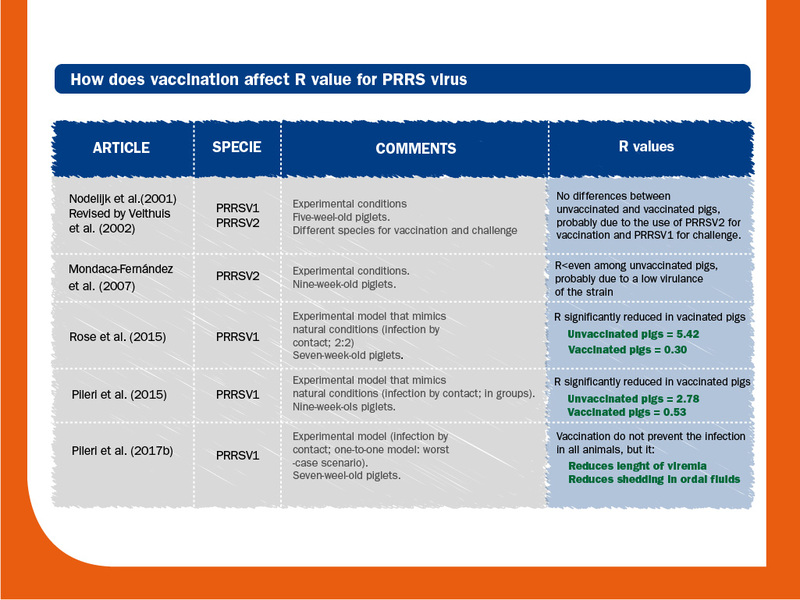 A low R value suggest that relatively low vaccine efficacies supplemented with other measures could result in a reduction of R<1. In fact, experimental studies that mimics natural conditions (using seeders in contact with naïve or vaccinated animals) have demonstrated that vaccination against PRRS virus could shorten viraemia and decrease the oral shedding, as well as reduce the R of vaccinated pigs to <1. In light of all the results shown in the present section, it can be concluded that vaccination can reduce the infectious load in the herd and that there is a potential use of mass vaccination in control programs for piglets. However, extrapolation of experimental studies to field conditions is somewhat difficult; in large population living together for a long period, as occurred in farms, it is possible that advantages afforded by vaccination could be insufficient. Therefore, management and biosecurity measures must be also implemented and/or improved.